Thanks MM!! I'm just sorry for the quality. Cool pictures Billy! Since none posted how Robbie did in the finals last night... how did he do? just talked to RR and he said he is SORE...he said there was a bike launched into the back of him off the start (1st turn) and took him and a few others out. He said the bike hit him in the back, side and back of his arm. It also hurt his shoulder kind of one whole side. He seemed pissed about it, but it is part of racing. And there is always tomorrow night. Go RR! He finished 7th...so not too bad coming from dead last and off the ground!! 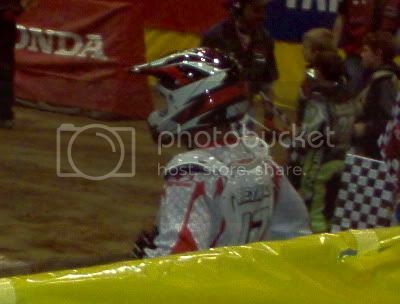 Wow, passing that many people on a tight arenacross track is no small feat!! Sounds like he was one of the fastest guys out there! What a bummer! Go Robbie! Kick some hiney tonight! Cherie: How did Robbie do last night? Looks like RR finished 7th again on Saturday night. This puts RR in third place in the series, 1 point behind second place and 29 points behind first place. GO RR! !